Anyone who knows a teenage boy understands this fact. 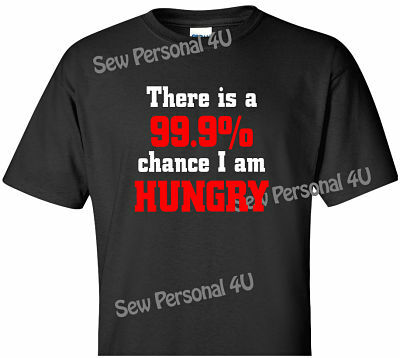 "There's a 99.9% chance that I am HUNGRY" Around here we call them human garbage disposals or say they have a hollow leg. No matter how you look at it, filling up a young man's stomach can be a challenge. So enjoy those years and get him a shirt. Shirt is a black unisex tshirt that fits either guys or gals.